Are people actually opening your promotional emails? Whilst open rate statistics differ from country to country and for different industries, a quick glance at industry benchmarks does not provide a very reassuring picture. The average open rate across all industries is 24% (Smart Insights). This means if you sent your email to 5000 subscribers only 1,200 would open it. And even fewer would go on to read and click. This is a problem. You can spend a lot of time and effort to craft an effective email. But there’s not much point if no one reads it. Luckily, there are things you can do to boost the probability of people opening your emails. 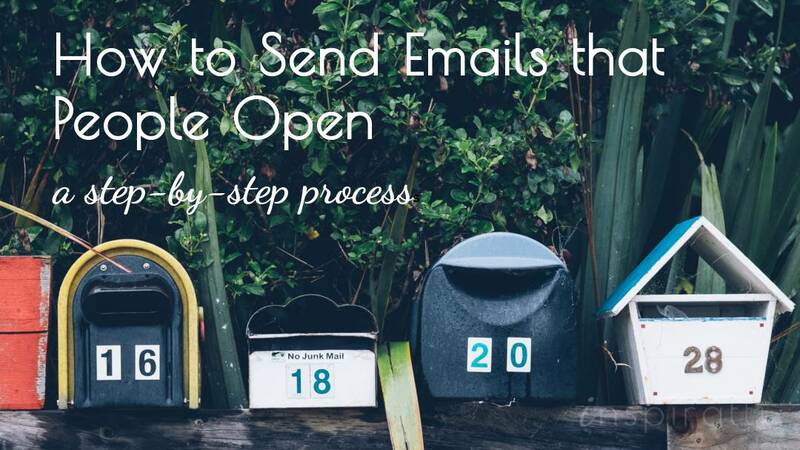 I have distilled the key considerations into a 6-step process you can follow to improve the open rate of your next email campaign. Let’s consider the first step. 35% of email recipients open emails based on the subject line alone (Convince and Convert). To write an effective subject line, you need to know who it needs to resonate with. For that, you need to get to grips with the data. Send to a specific segment where possible so you can craft tighter copy for your subject line focused on the precise needs of that audience. In fact, segmenting your list has been proven to increase open rates by 14.6% when compared to a non-segmented list (Mailchimp). There are many options for segmentation. You could send to a specific demographic group (e.g. if you have a promotion on a young women’s clothing line, you may only want to send it to women in their 20s). Alternatively, you could send it based on their past behavior (e.g. if they downloaded a whitepaper, you may have a product promotion). Will you send the email to an internal data list, or to an external data list? Which segment of the database will you send the email to? Decide the data before crafting your subject line. Once written, ensure the content, style and tone are geared towards creating a connection with your ideal audience. Your subject line should motivate your target audience to open the email by conveying a message they care about. To uncover this, you need to find the intersection between the value you are delivering in the email and the needs of your target audience, and incorporate this into the subject line of your email. Essentially, you should be very clear about the value you are delivering in this email and why they should pay attention. Does your email help your audience address a difficult problem they face in their daily life? Maybe you are offering free content on how to manage this issue, or are promoting a new product that delivers an immediate solution. Use this core value as a hook in your subject line. Fear of missing out? Excited to join? Inspired to move forward? Identify one core emotion you want to arouse in the copy and convey this in the subject line. The core emotion you choose should align with your objectives for the campaign. Say you have a limited time offer that you want people to take action on. You could draw upon the emotion of fear, and warn them that they are in danger of missing out if they don’t take action. For example, consider the subject line of an email I received from Leadpages: Ends Tonight: Last chance to get Leadpages for $100 off. Including someone’s first name in the subject line was found to increase open rates by 29.3%. But the success of this approach varies hugely by industry (Marketingsherpa). When I say personalization, I’m not just talking about using their first name in the subject line. There’s a more sophisticated (and effective) way to approach personalization. It’s based on people’s behavior. It’s about targeting people based on their interests and the previous actions they took. For example, I recently received an email with the subject line: Laura, do you listen to podcasts? It wasn’t the fact they used my first name that made me click, but the word ‘podcasts’. As I listen to a lot of podcasts, I was intrigued to hear what they had to say as it was relevant to my interests. There are many options for personalization. Imagine your subscriber has already bought a product from you. Try sending a promotional email on complementary products. Be sure to demonstrate how they will get more out of the product by making an additional purchase. Did you know that tweaking a single word in your subject line can boost open rates by over 20%? How do you know which words to use, and which to avoid? It’s important to consider the specific words you use in your ‘From line’. Sending your email from a person (i.e. laura@), rather than a generic address (i.e. info@), has been proven to boost open rates. Sending your emails at the wrong time can ruin your open rates. You need to consider the routine of your target audience and when they are most likely to open their emails. Consider the following questions to help you identify the optimal time to send your emails. Identifying the best time involves understanding the nature and behavior of your audience. This brings us back to the point on data discussed in step 2. Achieving impressive open rates boils down to identifying an effective subject line that resonates with your target audience, and knowing when they would like to receive it. Take time to go through these steps and incorporate them into your email marketing process. The extra effort is bound to boost the open rates of your emails. What next? Let’s consider your ideal reader for a moment. Your reader opens your email and starts to read the content. Will they read it and click, or skim the first line and delete? To deliver results, your email needs to engage their attention and motivate them to click. To do that, the content inside the email must marry up with the subject line. But there’s a lot more to it than that. There are some crucial elements that all successful emails include. Are you including them in your emails? If you want to find out what to include inside your emails, sign up for my free quickstart course ‘How to Create Engaging Emails that People Open, Read and Click’. You’ll uncover the perfect recipe for engaging emails that you put into practice in your email campaigns. Click on the button below to get started.